Amaretto is one of the most popular after dinner liqueurs and this flavored coffee lives up to that same familiarity � making it an exceptional dessert coffee. With a sweet marzipan undertone, your taste buds will love the hints of confectioner's sugar, almonds, and succulent apricots mixed into this creamy flavored coffee. 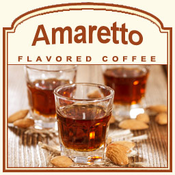 Amaretto coffee is made with 100% authentic Arabica beans, and although this gourmet coffee features this beloved alcoholic flavoring, this delicious coffee is non-alcoholic. With 2 calories in each cup, you can enliven your taste buds without worrying about the calories. Roasted and shipped on the same day, your Amaretto flavored coffee will arrive in a heat-sealed valve bag to ensure the utmost in quality and freshness. Indulge in this classic Amaretto flavor!